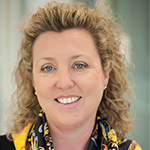 Renee Ryan, Vice President, Venture Investments, joined Johnson & Johnson Innovation – JJDC, Inc. (JJDC) in 2011. She is based in Silicon Valley, California and primarily supports the strategic investment activities in medical devices. Mrs. Ryan’s background includes over 15 years of healthcare investment banking. Most recently, she ran the medical device investment banking effort at R.W. Baird & Co. Previously, she lead the West Coast healthcare group at Jefferies & Co. and was in the healthcare investment banking groups at Goldman Sachs and Credit Suisse. Mrs. Ryan received an MBA from Columbia Business School and a Bachelor’s degree from Georgetown University. She was nominated for the Silicon Valley Business Journal “Women of Influence” in 2011 and participated in the Smith Tuck Global Leaders for Women Program in 2014. She recently was nominated to the Fierce Medical Devices Top Women in Medical Devices 2015 list.